Product #17038 | SKU PMWF5 | 0.0 (no ratings yet) Thanks for your rating! The Sony PMW-F5 CineAlta Digital Cinema Camera features an 8.9 MP Super 35mm image sensor capable of capturing 2K and HD internally in Sony's XAVC codec onto SxS PRO+ memory cards, and 4K and 2K RAW to an optional Sony AXS-R5 external recorder. It features 14 stops of dynamic range, applicable to both RAW and XAVC recording as long as S-Log is turned on, for truly film-like rendering of highlights and shadows. The camera natively features an FZ mount and includes a PL-mount adapter. In addition to the AXS-R5 recorder, a digital interface on the F5 allows for a variety of optional viewfinders. DVF-EL100 is a 0.7"/ 1.8 cm OLED viewfinder with 1280 x 720 resolution. DVF-L350 is a 3.5" LCD viewfinder with 960 x 540 resolution, and the eyepiece flips up for direct monitoring. DVF-L700 is a 7" / 17.8 cm LCD viewfinder with 1920 x 1080 resolution for monitoring Full HD pixel-for-pixel. Other modular components include the optional Sony shoulder rig, which features industry-standard rosettes on both sides for quick and easy attachment of third-party hand grips and other accessories. The F5 is designed to accommodate a wide range of lenses. With the PL-mount adaptor, you can take advantage of acclaimed cine optics from Angénieux, Canon, Carl Zeiss, Cooke, FUJIFILM, Leica and more. Slip off the supplied PL-mount adaptor to reveal the native FZ-mount with an 18mm flange focal distance. The FZ-mount provides an interface for native FZ lenses like Sony's SCL-Z18X140 auto focus servo zoom lens or a range of adaptors for still lenses, including Canon EF, Canon FD, Nikon F, Leica M and more. 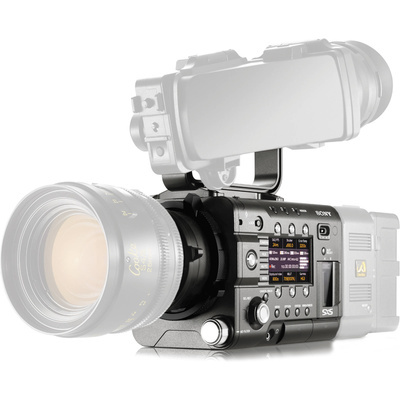 Designed with significant input from cinematographers, the F5 features an intuitive interface for a range of controls. Instead of diving through menus, you get direct, one-touch access to key shooting parameters including frame rate, shutter speed, colour temperature, ISO sensitivity and gamma. Assignable buttons mean that your favourite adjustments are always at your fingertips.